“Good writers borrow from other writers. Great writers steal from them outright,” Aaron Sorkin. Both the bestselling book for creatives, and the remix for writers contains handy tips. You can leaf through some of the book at this Bloggers Kit held on flikr, and read more about it from the book site. The Remix into Steal Like A Writer makes several points about writing life. I’ve quickly documented them below, but recommend you watch the 33 minute video and download the PDF while it’s available from the WMC website also. 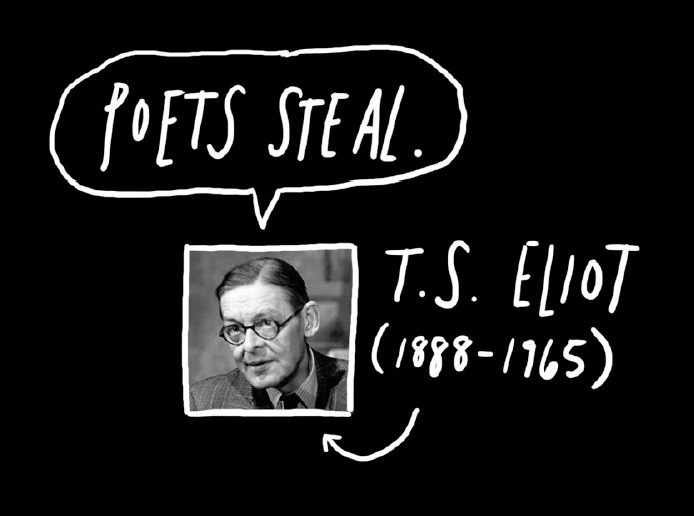 Why is Stealing a Good Thing? 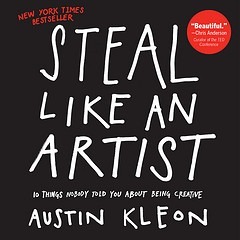 – Austin points out that writers (and artists) have been doing this for eons. He gives some good examples – Pablo Picasso, David Bowie, Bob Dylan, Steve Jobs, Woody Allen. All writing is a collage. As human beings we constantly collect stuff and recombine them. Read. (See X for X-Ray Reading also) You have to read. Good reading leads to good writing. Keep a swipe file. (See I for Ideas Inventory) to keep everything you’ve found. Start with one writer you really love. Read the stuff that came before this book – swim upstream. Read with a pen – write in your books. Argue with the author in the margins. This has a name – marginalia. Always carry paper and pen. And a notebook. Keep Lists. Lists tell stories too. Step away from the screen. Don’t wait to Start. The act of writing can uncover thoughts you never knew you had. “We don’t know where we get our ideas. What we do know is that we don’t get them from our laptops.” ~John Cleese. There is something about switching from digital to analogue that gets the mind working. Use index cards, stationery supplies. Don’t find time, make time. Schedule chunks onto a calendar. Check the box, don’t break the chain. Write something you want to read. Tell Oprah Stories. (See the video for an explanation of this, the PDF contains sample graphs). Stephen King has one ideal reader, who happens to be his wife. Write for just one person. Distance yourself from the writing by sticking it in a drawer for a while. Practice Writing in public. Start a blog, write on twitter. The simple act of having your ideas out in public will make you a better writer. Pick up the accompanying PDF slideshow for this presentation from the Speakerdeck WMCFest page here. Kleon has a Tumblr where he shared the above list graphic from his speech. Update: May 2013 “Develop Your Narrative Voice By Stealing From Bestselling Authors” Elise Abram talks about modeling, not plagiarism. This blog post participated in April 2013’s Blogging from A to Z Challenge, along with many other blogs on subjects as diverse as writing, foodie blogs or mummy blogs. This blog post is part of a themed series or pack on Writer’s Core Habits. I acronym this as WCH or WCHP © . Do a search for these tags, and you will find more in the series. No affiliate links are used in these posts.